Anti-pipeline protesters erected a shelter this week along Centennial Way on Burnaby Mountain, located in Burnaby, BC (a suburb of Vancouver). 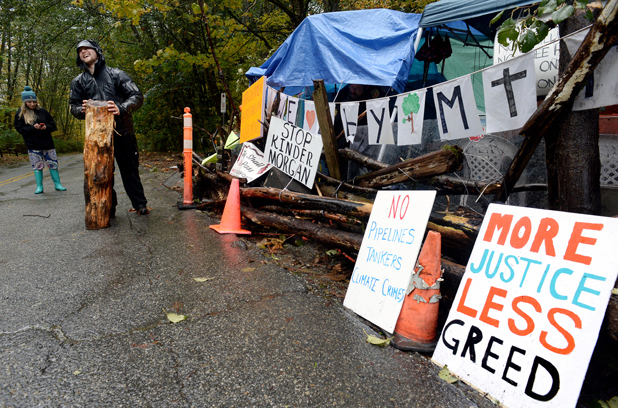 The protesters are hoping to block Kinder Morgan from resuming surveying work in the conservation area. 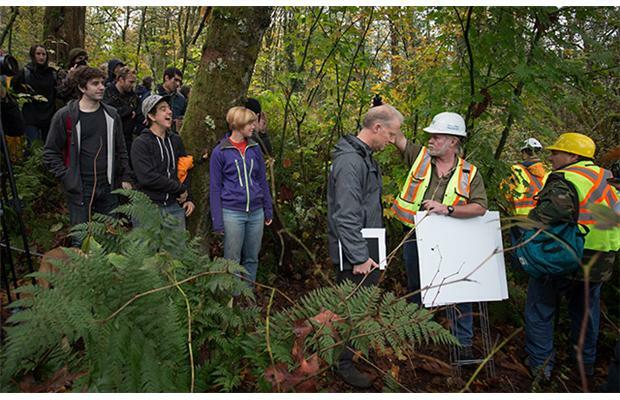 Protesters confront workers contracted by Kinder Morgan to carry out survey work on Burnaby Mountain, November 2014. An RCMP lawyer told the B.C. Supreme Court on Friday that if it grants Kinder Morgan’s application for an injunction to block protesters from interfering with its pipeline survey work, that the court should make clear what “zones” in the park protesters can still express themselves. Posted on November 7, 2014, in Oil & Gas, State Security Forces and tagged Burnaby Mountain, Kinder Morgan, RCMP, RCMP and Natives, TransMountain pipeline. Bookmark the permalink. Leave a comment.